Sometimes I go searching for a project, and other times a project finds me. While I was in a chain craft store buying cotton for dishcloths and washcloths, another yarn caught my eye. It was Lion Brand Wool-Ease Thick & Quick Stripes in colorway 602 Crimson. My husband is a lifelong fan of University of Alabama football, otherwise known as the Crimson Tide. This yarn was all but made for him. 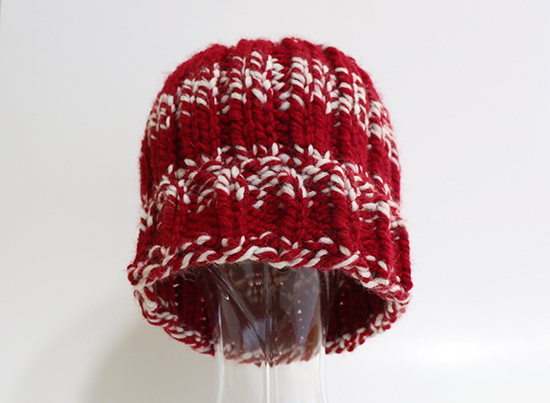 With one skein in hand and a vague plan for a hat, a Ravelry search brought me to the free Big Chunky Comfy Hat pattern by Erica Kempf Broughton. I like the simplicity coupled with the one little detail that takes it up a notch from a plain hat. The yarn, however, had other ideas. Can you see the stitch detail at the top of the brim? How about now? The two-color sections of yarn make the pattern difficult to see and, unfortunately, a two-color section and the one detailed row of stitches both happen to fall in exactly the same place. I could have frogged the hat and shifted the yarn to make sure the detail fell on a solid stretch of yarn, but I think the two-color sections would have ended up competing with the detail. I frogged the hat and switched to a basic K2 P2 ribbing. I based sizing decisions on the initial pattern, and I’m much happier with the result. So is our eight-year-old, who quickly claimed the hat. I’ll keep the Big Chunky Comfy Hat pattern in mind the next time I have a more subtly-colored super bulky yarn. And I want to add that when Lion Brand named the yarn “Thick & Quick,” they weren’t exaggerating. I wet blocked the first hat before I decided to start over; after two full days of drying it was still damp — and we live in a dry climate. 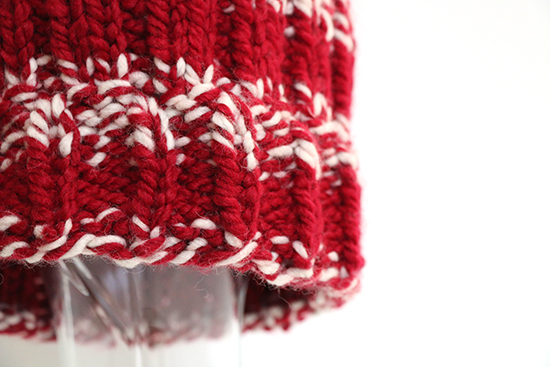 I knit each version of the hat on US-11 (8 mm) needles in about two hours. 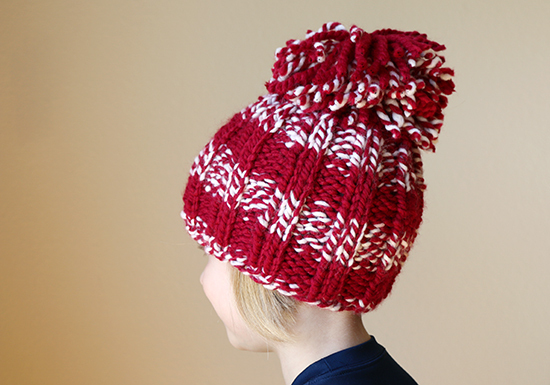 We now have three of these one-size-fits-all hats, two of which have pompoms, from two skeins of yarn. Bring on football season and Roll Tide! Hi, I came here from the Front Porch. TY for adding your link there on Small Business Friday.